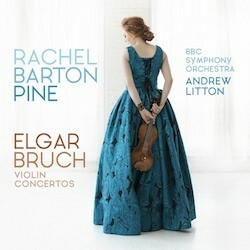 Billboard chart-topping violinist Rachel Barton Pine releases her 36th album and fourth for AVIE with her first recordings of two repertory staples, violin concertos by Edward Elgar and Max Bruch. 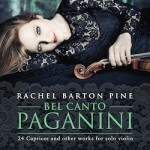 The two works – Elgar’s only concerto for violin and Bruch’s first – straddle the turn of the 20th century but have in common a Romantic hue which Rachel probes with her rich, soulful tone. 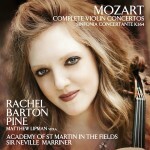 The album is dedicated to “the memory of a musical hero and generous friend, Sir Neville Marriner,” who was to have reunited with Rachel on this album. She was fortunate to work with him on the scores, with Sir Neville vividly relating accounts of his teacher Billy Reed, former leader of the London Symphony Orchestra, who collaborated with Elgar on the creation of his violin concerto. Grammy Award-winning conductor Andrew Litton brings his own Romantic pedigree to the recording, as does the BBC Symphony Orchestra and celebrated producer Andrew Keener who himself has overseen award winning versions of the Elgar and Bruch concertos.